The Syrian army has reportedly entered Palmyra trying to retake the city from ISIL (Syrian state TV says troops enter ISIL-held Palmyra Al Jazeera 25 Mar 2016 ). The desert oasis town is an important road junction but right on the edge of ISIL territory, but nevertheless has been able to hold off regime troops since it fell to ISIL in May 2015. The current offensive has been supported by Russian airstrikes. If successful, the ongoing Syrian army offensive will "cut the Islamic State group of forces in two and open the road to Raqqa and Deir ez-Zor, and create conditions for reaching the border with Iraq and establishing control over it", said a Russian general. 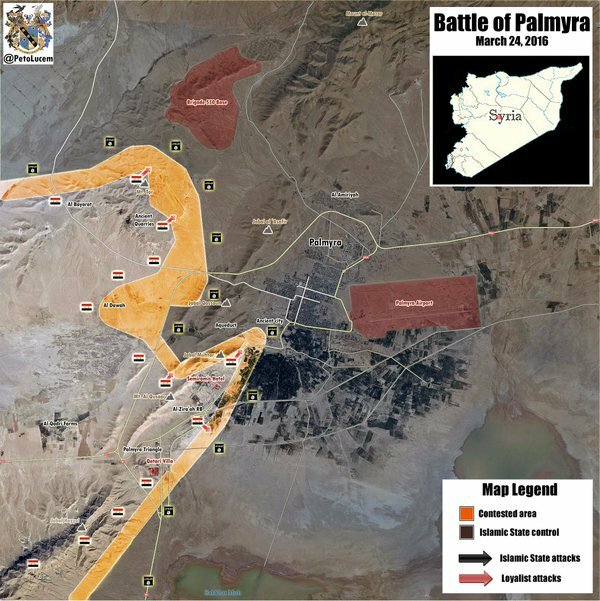 (see also 'Syrian Troops Poised to Recapture Palmyra from Islamic State' ARCA 24th March 2016). One Russian officer has been killed in the Palmyra offensive (the sixth known Russian military death reported since the start of Russia's Syria operation). 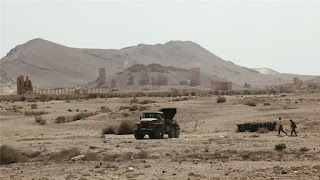 Unfortunately, the main group of ancient ruins are between the current positions of the Syrian army and the modern town which is the objective and once again are in the front line, subject to shelling as well as the construction of defensive structures (such as foxholes and gun emplacements). 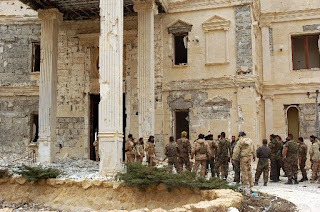 We also recall that ISIL is reported to have planted explosives around the ruins, possibly as booby traps for those that may attempt to use them as shelter. Here is a a photo from CNN which may show Syrian troops within the ancient city.